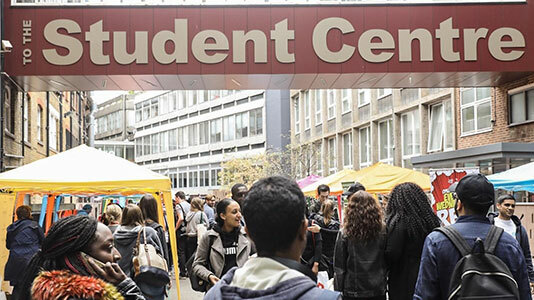 London South Bank Students’ Union (LSBSU) is the centre of student life on campus and home to a number of key services and activities designed to help you get the most out of your student experience. Coming to university is about more than getting a degree, it’s a time for you to develop your passions and bring those dreams to life. We believe ‘Every student matters’. Our Students’ Union exists to enhance your student experience and represent students’ academic interests, both on and off campus, whilst you study with us. Supported by a team of staff, four full-time student reps “sabbatical officers” work to represent student views, run campaigns and speak up on your behalf, including holding roles on the University Board of Governors. Many students also volunteer part-time to act on behalf of students in many areas. Research shows that students at LSBU who get involved in co- and extra-curricular activities are more likely to do well academically. That’s because, like in life, it’s all about balance and the connections you make. Whether you’re part-time, post-grad, mature or a more traditional student we offer everyone the opportunity to feel a part of the community we have on campus. The Union is a hub for a range of student run societies that cover a broad range of cultural, academic and social interests, and if we don’t have the society you’re looking for we’ll help you start it. Alongside student societies we also run all competitive and non-competitive sports on campus. The Union also runs a variety of events throughout the year, including socials, pub quizzes and nights out. All of the Unions activities are either free or low costs and are a great place to make new friends and develop your interests. We hope that you’ll never need these services, and the vast majority of students don’t, but it’s good to know that the Students’ Union operates an independent academic advice service. It’s designed to make sure that if things go wrong with your course, you’ve got free access to independent specialist staff who can help you put it right. To find out more about the Union and what they have to offer you, visit the LSBSU website.